This week's adventure started off by departing the wonderful New Acropol Hotel in Morogoro for the Udzungwa Mountains. Emily was treating us to a real African experience by staying at Hondo Hondo camp. Unknowingly, the route to the town of Mikumi, which we needed to pass through, took us through the Mikumi National Park. What came next was a complete shock! We basically received a free safari along the way since we were able to witness giraffes, water buffalo, warthogs, some sort of antelope, zebra, and MY FIRST HERD OF ELEPHANTS!!!!!!! It was absolutely amazing! Emily and I were beyond ecstatic about the experience. After calming down we proceeded to Hondo Hondo camp and settled into our banda. We went for a little hike on their nature walk after some refreshing sodas and I found a new Ledebouria and Emily a fern! That evening we enjoyed dinner and a somewhat warm nights sleep. 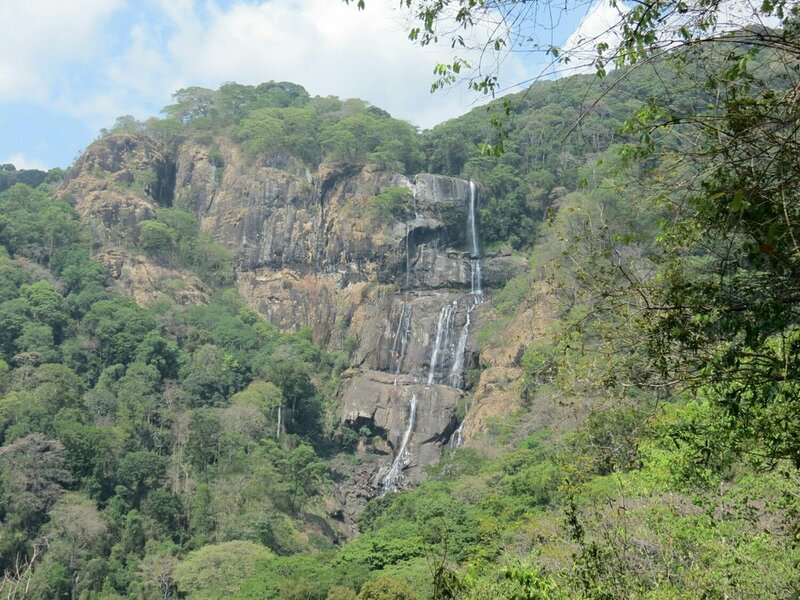 Despite the sweaty night, we awoke ready to tackle the Sanje Falls hike in the Udzungwa Mountains National Park. Enjoying some huge Scadoxus near the start of the Sanje Falls hike at the Udzungwa Mountains National Park. Upon arrival at the park headquarters we were greeted by Ali who would be our guide for the day. After paying half-price entry fees because Emily and I are technically residents of Tanzania, we set off to the trail head. Ali was an excellent guide and educated us about the plants as much as we educated him. The hike up was steep but was filled with fascinating geophytes including Scadoxus, Amorphophallus, and Ledebouria. The humidity was high and the sweat was pouring off of us but upon arrival at the first viewpoint, we were happy we struggled through. Sanje Falls. If you look close enough you'll notice a familiar shape. Reaching the top felt like a little victory and I did not hesitate to drop my clothes (except undies) and take a dip in the falls. As I was drip drying I walked around looking at the wonderful plants that luxuriated in the spray from the falls. Wild impatiens, begonias, ferns, and gesneriads all grew along the water's edge. After lots of rock hopping we headed back down to one of the most amazing views I can remember where we looked out upon the valley towards Mikumi National Park and the Selous Game Reserve. In between were acres upon acres of sugarcane fields and little villages. At this place we also saw our first true tree fern as well as a plant in the Melastomaceae. We then hiked the same route back to the car where we were greeted by a freshly washed vehicle and people eager to sell us curios. Back at the camp we relaxed, enjoyed dinner while watching the various primates play in the trees, and prepared for the long drive back north to Korogwe en route to the Usambara Mountains. The view of the valley from the top of Sanje Falls hike. We safely arrived at Korogwe, slept, and then awoke to make the short drive up the steep and curvy road to Lushoto. This wonderfully cooler weather in the mountains made it great habitat for finding ferns and I did not hesitate to stop so Emily could make valuable collections along the roadside. We soon arrived at the Irente Farm Lodge where we would be camping and hiking around the area. After a relaxing afternoon of specimen prep, blog writing and "vegging out", we attempted to hiked to the Irente Cliff Lodge where we could get a view of the valley below from the Irente Viewpoint. We were unsuccessful in our attempt since we walked pass the turn. After walking in the wrong direction for a good while we realized our mistake and began to walk back. This is when we noticed the large dark cloud moving over the mountain and realized we left the rain fly off of the tent. We rushed back in the pouring rain with the idea that our things would be as soaked as we were. Upon entering the campsite, we were flagged down by a staff member who had so graciously moved our tent under an overhang out of the rain. Our first rain in Tanzania was a wet one but well received. Keeping dry after a wet walk at Irente Farm Lodge. The following day we headed towards Mazumbai Forest Reserve near Bumbuli. We were unsure of the location of the entrance which lead us to take the long, rough, bumpy, and exciting road to the reserve. Soon after arriving we set off on a hike to the highest point in the reserve. Along the way we encountered numerous fern species that Emily was able to sample, several fallen logs which were covered in the highest branches, and I even saw a nice orchid. Soon the path we were on headed almost straight up and we were soon surrounded by epiphytic species of all sorts and the weather was nice and cool. The way down was as sharp going down as it was up and I only managed to fall backs once, gracefully of course. Hiking through Mazumbai Forest Reserve. Our last hike at Mazumbai was around the lower perimeter of the reserve. In this area we were basically forging our own path through the thick understory, which at any moment your leg could be consumed by an unseen hole formed by a buttress full of leaves or a rotten log. We kept this hike shorter and took our time to enjoy the huge trees and dark understory. We then just relaxed all afternoon and prepared for the trek back to Dar the following day. I also showed the guides some Ledebouria pictures and they informed me that it grows in the rocky, drier places of the reserve. Maybe I can come back sometime soon! A huge buttress with our guide Mamoo for scale. Our drive to Dar was uneventful but filled with good convo about academia, life and plants. We arrived at our luxurious hotel complete with breakfast, Wi-Fi and hot, hot showers, a thing I have come to really appreciate. Emily leaves Tuesday so we'll spend her last day souvenir shopping and enjoying what things the big city of Dar es Salaam has to offer. I head to new adventures in Zambia this coming week with my good friend Killian who will be joining me for the remainder of my time in Africa. Fingers crossed all goes well with permits in Zambia! Until next time.